Charles Duhigg of The New York Times has been doing terrific work in his series on water pollution in the United States—an environmental issue that often gets short shrift with climate change hogging the green spotlight. And his latest dispatch adds a peculiar twist. Over the years, environmentalists and policymakers have been quite successful at forcing coal plants to scrub out pollutants from their air emissions. But the effort has had at least one unintended consequence: The chemicals from the scrubbing process sometimes get dumped into rivers and streams as wastewater, which is less tightly regulated than air pollution. [N]o federal regulations specifically govern the disposal of power plant discharges into waterways or landfills. Some regulators have used laws like the Clean Water Act to combat such pollution. But those laws can prove inadequate, say regulators, because they do not mandate limits on the most dangerous chemicals in power plant waste, like arsenic and lead. For instance, only one in 43 power plants and other electric utilities across the nation must limit how much barium they dump into nearby waterways, according to a Times analysis of E.P.A. records. Barium, which is commonly found in power plant waste and scrubber wastewater, has been linked to heart problems and diseases in other organs. 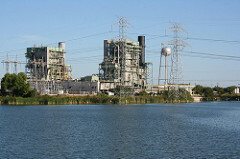 Even when power plant emissions are regulated by the Clean Water Act, plants have often violated that law without paying fines or facing other penalties. Ninety percent of 313 coal-fired power plants that have violated the Clean Water Act since 2004 were not fined or otherwise sanctioned by federal or state regulators, according to a Times analysis of Environmental Protection Agency records. Anyway, in theory, the EPA could try to tighten clean-water rules, but power companies tend to be good at swatting away regulations they don't like: "In 2000, Environmental Protection Agency officials tried to issue stricter controls on power plant waste. But a lobbying campaign by the coal and power industries, as well as public officials in 13 states, blocked the effort." The current EPA head, Lisa Jackson, has said she'd like to explore the possibility of new controls, but she's already facing a fair bit of opposition.